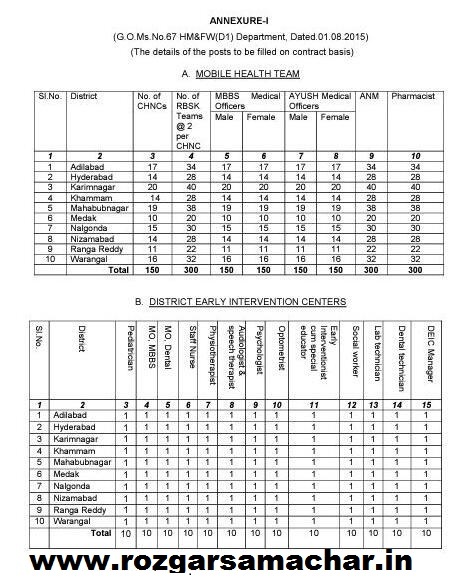 Application are invited for the eligible and interested applicant toward the 1330 vacancy of Mobile Health Team, District Early Intervention Centre. Applicants may apply through send application form to Rashtriya Bal Swasthya Karyakram department before 14.09.2015 to 16.09.2015. Applicants form is available on Rashtriya Bal Swasthya Karyakram (RBSK), Nalgonda, Telangana website. Applicants must have MBBS degree. 18-44 years is the age limit for this RBSK recruitment. And candidates can download the prescribed RBSK application form from the official website. Read the Rashtriya Bal Swasthya Karyakram (RBSK) official notification before applying for this RBSK Telangana recruitment 2015. Further information such as application procedure, selection procedure, last date to apply, admit card, date of exam etc. are given below. Address: DM & HS Campus, Sultan Bazar, Hyderabad – 500095, Andhra Pradesh (India). Education qualification: MBBS degree or an equivalent & must be registered with AP Medical Council for MBBS Medical Officer, Degree in Ayurveda (For Ayurveda & Homeopathy), Degree in Unani (For Unani), BNYS degree or a diploma in course in Naturopathy (For Yoga & Naturopathy) for Ayush Medical Officer, SSC with 18 months MPHW (F) Training certificate recognized by AP Nursing and Midwives Council for ANM, SSC with Diploma in Pharmacy & Registered with Pharmacy Council for Pharmacist. Refer the notification for remaining posts. Age Limit: 18-44 years as on 01.07.2015. Age relaxation is 05 years applicable for SC/ ST Candidates, 03 years for Ex-Servicemen, 10 years for Disabled persons. How to apply: Eligible applicant require to send their application along with supportive documents. certificates like SSC or equivalent, Intermediate or 10+2, qualifying examination, marks memos of all the years (qualifying examination), registration certificate of respective councils, latest caste certificate issued by the Tahsildar/ MRO concerned, study certificate for the years from 4th class to 10th class and in case of Private study residence certificate from the Tahsildar/ MRO concerned etc., to the Respective District Medical & Health Officers to the district to which the candidate applying from 14.09.2015 to 16.09.2015. Write on the envelope “Application for the Post of Mobile Health Team, District Early Intervention Center”. Application should be Reach to: - DM & HS Campus, Sultan Bazar, Hyderabad – 500095, Andhra Pradesh (India). Issue of Notification: 24.08.2015 to 30.08.2015. Last Date for Submission of Application: 14.09.2015 to 16.09.2015. Scrutiny of Application: From 17.09.2015 to 22.09.2015. Display of Merit List: From 19.09.2015 to 24.09.2015. Issue of Appointment Order: From 24.09.2015 to 30.09.2015.